This is the demo version of my Deluxe Version of You VS Boo, one of my greatest creations and my first game that won a MGC entry. The goal is to finish the level before Boo does. You can change Boo's speed in the "Level Settings" menu and also Mario's status when he starts. You can choose from: Small, Normal, Fire, Mega, Mini Mario each with some unique skills. Small and Mini can fit trough smaller places, Mega mario can smash himself trough levels and Normal and Fire are quite neutral. You can also perform a wall jump by pressing shift when you are near a wall and press the key in the direction of the wall. This demo has only one mode, expect more modes and levels in the full game. Only Problem is 2-2 is WAY too hard. Anyway, I love this game completely. really nice game but wheres the blue koopa shell!?!?!? Hmm. I didn't notice that it wasn't there. Looks awesome! I know the first one was good, so I'll download this one soon! In the origanal, my internet icon starred. Does he appear in this one as well? I'll find out. Nevemind, I looked at the screenshot again. very nice and challenging game but shouldn't the mega power-up be found in the maps and not be a setting in the menu? This isn't about the game but how do i make games? But, great game anyway. That was really, really fun. What did you use to make the game and what engine? I used GM6.1A and it's my own engine. The game sounds great! The only problem is that Gamemaker 6.1 does not work on Vista, bud. Use the GM Vista Fix in the misc menu. That game is VERY fun and VERY addicting! And there are no glitches whatsoever! Awesome job!! Do you think that you could release an 8bit NSMB engine? By far, the best minigame in all of mfgg. Elaborate, free ranged, downright fun and not too difficult so anyone can play! Hooooo boy. You've got a ways to go before you can make a masterpeice! To make games, you usually need to know a programming language and write a custom game by typing in the functions, redirecting images to their actions, setting audio functions, etc. But if you're content to make fairly simple games, go to Google and look up "Gamemaker." To use this, no programming skills are needed, although it still is a bit complicated. Have perseverance! Google is your friend for more than just that, BTW, Jak. And welcome to MFGG! never looked at this game is it good? oh, it's not good... It's fantastic! Veri good game,bi the wai I'm Jaks brother wheres the matishee ma koopa shell. hey bro! (Geg) what does that mean? This game is excellently designed and 99% flawless, but I don't like it. It's a great game, but it's just not fun for me. Huh. Well don't be sad in the face, that's my problem, not your game's. i have smb dx , and there are not more than 8 levels! [quote=jak,Mar 29 2008, 4:54 PM]This isn't about the game but how do i make games? How do I make games? Hi. New to MFGG. I've noticed some games won't work for me. I'm using vista. This game won't run, nor will any game with a red ball icon. World 2-2 in the original is hard, too. If I knew what Vista was, I could probably help. What's Vista? Do you think you could make a DDR-based game? That would be awesome! I mean, I think you did good on this game, so I thought I'd ask. This game Is awesome! I play it all the time. Unless you cheat. This is a great game! Use the Vista Fix in the Misc section. It will convert the games to be able to work with Vista or you could download a Windows emulator. BTW Flipiberke you are a God at game making! 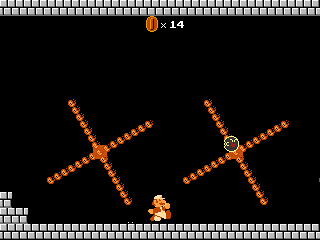 can you add minigames in the full version, like the new super mario bros ? Can you submit the engine?